I really wish I had been in the editorial meeting when this was brought up for approval. I mean, DUH. Martha Stewart + Crafts + Reference? Complete and total no-brainer. 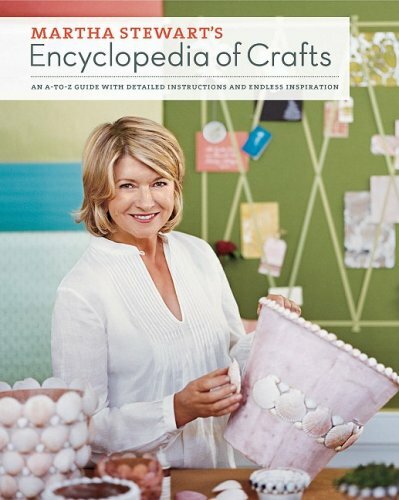 I bet the editor just said "Martha Stewart's Encyclopedia of Crafts " and everyone else said "Yup," and moved on to the next title on the agenda. It doesn't disappoint (okay, it doesn't disappoint ME). (I loves me an A-Z format.) The projects are everything you'd expect from our friend Martha, and more … incredibly cute pom-pom baby chicks, scrolled-paper hearts, rubber-stamped rain hats … if it can be painted, cut, folded, beaded, silkscreened, marbleized, stamped, glittered, punched, or glued, Martha will tell you how to do it. With impeccably-styled full-color photographs, of course. If you are a known crafter (and not a vocal Martha-hater — I know they exist, but I don't get it, the woman is like a superhero—or at the very least, Lex Luthor, and I've kind of always had a soft spot for Lex Luthor) and do not receive this book from a loved one at the next major holiday, you may need to consider whether or not anybody loves you. I'm sorry, but that's just the way it is. I will own the fact that Martha does sort of drive me nuts, and not in the good way. However, that doesn’t keep me from acknowledging that her projects are excellent. I’d love to have a copy of this and the time to actually work through it. sadly, that’s not gonna happen. Martha makes me laugh – so much attention to detail she has to have some idea that she’s not strictly ‘normal’I still remember an elaborate “Peter Rabbit Carrot Cake” a friend wanted to make for her son’s birthday. The cold goo was all in a bowl and Martha firmly instructed that the icky brown-beige goo be mixed with your hands. Bleah upon bleah. A wooden spoon sufficed.She does have good recipes, and it’s amazing to see the decorative items for seasonal events. I make fun of her, but yeah, I take her magazine. Blueprint was too good to last! Listening to Martha is annoying, but her cookbooks, craft books are great. She is talented and organized (and has the staff to help her). But you can gain alot of knowledge from her sources. I can understand why people hate her so much. She’s (practically…hello, prison?) perfect! Everything she touches turns to gold. She is the craft queen! I will definitely check this book out. I don’t really know who Martha Stewart is. But I don’t know anybody who would think glueing shells to a lampshade is a good idea! Maybe in the 80’s, but now thats tacky. But to be fair arts and crafts isn’t really big over here. Why are women held to a different standard?No one hates Ichiro for being better than the rest of us. I like Martha’s shirt. Pinktucking all the way. I’m neutral on the subject of Martha Stewart, but I would like to criticize this cover. It’s pre-outdated: it looks like a crockpot cookbook from 1972 that you find at a garage sale. I’m not so sure that I love Martha personally, but I do love her show and magazine! The recipes, crafts, gardening tips are fantastic. At the very least, she surrounds herself with very talented people and has excellent taste. I’m definitely a fan! Have not read the comments before me to be honest, but I think that overall Martha Stewart gets a bad rap. You don’t have to do all her mag talks about. Just use it as a source of reference. I don’t do it all but if I want to do something Special I know she has my back ~ she knows how to deal with things. Take what you need and leave the pressure behind. MS rocks. Leaving this as Anom only because I have computer issues. Am the same person who read the dress stories to grandma while she was ill. Just trying to tell you who I am. I am pretty shy. Wear a Dress. You Will Feel good. Party on! I gave up on MS crafts when the intructions told me to drill out the insides of an acorn before gluing it to a wreath. She’s talented and obviously an excellent businesswoman. But she only gets my money when her K-Mart sheets are on sale. Martha’s not exactly into “honour”. There’s not only the stock business (she was a former stockbroker, and bragged to friends about how she and her own broker were breaking the law), but she’s infamous for stealing others’ craft ideas without attribution, and making them her own. Running craft ideas down to their original sources really can be tricky, but she’s failed to credit others so much that her inability to attribute can’t really be considered either incidental or accidental.Even so, I have kind of a love-hate relationship with her stuff. Other than some of the covers (yes, Marla! ), her books are production dreams, and you gotta love reading about some of her loonier projects. Who else but control-freak, staff-enabled Martha could cook up an eighteen-hour gingerbread house project, for example?She’s really a pretty loathsome human being, but on the craft front, sometimes you just have to shake your head and recognize the MS franchise as the force of nature it is. On the stock side, at least you can figure she’s probably not making that particular mistake again. FWIW, I took a hand-quilting class with the mother of one of Martha’s underlings. My classmate said MS was perfectly lovely to the family when classmate’s husband died, and she had not a bad thing to say about MS. Since I own MS stock and it has tanked, I’d like all of you to get out there and buy this book and all other MS products. You’ve got 20 years before I retire, so you don’t need to do it today, but just toss it on your to-do list and I’d be ever so appreciative!Paisleyaprong is right: M’s shirt is awesome.I can’t wait to check this book out! She didn’t go to prison for insider trading, but for perjury. The same charge that was just dropped against Ted Stevens of Alaska. I cannot stop laughing about what Marla said about the cover. She really pegged it! I didn’t wait to find out if I am loved. I walked into the bookstore; it was prominently displayed at the door, I picked up a copy, paid for my mocha latte and the book, deed done. The moment Martha showcased that book on her show I promised myself a copy, no guilt, no explanations, just make it mine. And I agree with you, it was worth the price and I was not disappointed but then we knew we wouldnt be didnt we? :o)As for the Martha haters, lets face it the world is full of mean spirited, small minded people who just cant tolerate someone being a success when theyre not. It’s their loss. I so agree with what Pamela said. The book is definitely on my list and hey… Martha did her time which is more than you can say for most of the scum on Wall St. I should think that would warrent support. My sisters despise MS with a white-hot fervor. I like her, in a low-key sort of way. I will have to get this one on inter-library loan and check it out. (The afore-mentioned siblings obsess constantly about housecleaning and my place usually looks like a dog-hair tornado hit it, which may offer a clue). Sorry, I don’t “do” Martha. I either already know how to make it or know I don’t want to bother, and already collect it or know that I never will. I always thought her books and magazines were more for the young marrieds whose mammas didn’t teach them how to sew with a hand needle at age 4, like mine did.